Eyelash Extensions vs. Lash Lift: Which One Should You Get? We asked a professional about the differences between the two services to help you nail down the best option. Technician applies eyelash extensions to customer. If you’re tired of removing heavy mascara with an oily remover every night (or if you’re just not taking it off at all! ), it might be time to look into another form of lash enhancement. Eyelash extensions and lash lifts are now available in many spas and salons throughout the country, but how do you know which treatment is right for you? To set the record straight, we asked Andrea Starr, lash expert and founder of Starr Beauty and EYESTARR, and Clementina Richardson, founder of Envious Lashes, for the low-down on lash lengthening treatments and how to figure out which is right for you. What is the difference between a lash lift and eyelash extensions? A lash lift is basically a treatment that replaces the need to use an eyelash curler, where the technician will clean your lashes, glue down a silicone shield onto your upper lid, apply adhesive to that shield, lift your lashes up onto the silicone shield, and then apply the odorless, non-damaging lash lift product to your lashes. “[Lash lifts] are great for clients who have straighter lashes and use a curler daily,” says Starr. Before the treatment begins, the technicians will customize the curl shape based on your natural lash length, how you like to style them, and what your curl preference is. Then, they will choose a specific silicone pad (which comes in multiple sizes) based on your answers. Eyelash extensions, on the other hand, are synthetic lashes that are actually attached to your existing lashes. “With each client, we have an expert consultation and style them based off exactly what the client is looking for, their lifestyle, and how their natural lashes lie to achieve the most natural and beautiful look,” says Starr. 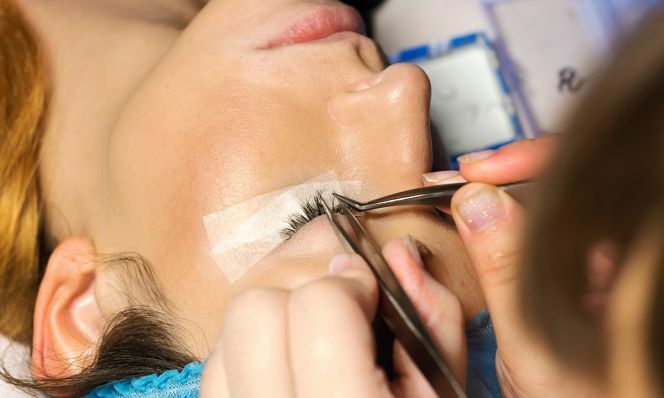 After sitting on a bed, the technician will ask you to close your eyes as they put an adhesive strip underneath your lower lash line (kind of like an undereye mask). Then, they will begin gluing each synthetic lash to your individual lashes. How long does each process take? A lash lift treatment will take about 45 minutes from start to finish, and the treatment is painless and pretty relaxing. Eyelash extensions are little more tedious, and can take up to 2 hours to finish, depending on how many lashes are needed to achieve your desired look. Additionally, the glue that’s applied to your existing lashes before applying the extensions can sometimes, very slightly, sting your eyes a bit, making the process longer and a bit more uncomfortable than a lash lift. How long does each treatment last? A lash lift can last up to eight weeks, while extensions can last anywhere between four and six weeks. Lash extensions can last longer with maintenance, where you come in every two weeks and get lashes that have fallen out replaced with new ones. What is the aftercare for each treatment ? After a lash lift, you want to avoid applying any eye makeup to the area for a full day, but then can treat them as you normally would (sans eyelash curler) the following day. Unless you get an eyelash tint along with the lash lift, your lashes will not look darker or fuller after a lash lift (but they’ll look lifted and more wide awake), so you’ll probably want to continue using a mascara daily, if that’s in your normal beauty routine. Post-eyelash extension care requires more time and effort. “After the lash extension service, you want to avoid getting them wet for the first day; after that, cleansing and washing your lashes is crucial for the longevity of your lashes,” says Starr. Additionally, “you also need to avoid rubbing your eyes, using oil-based products and heavy creams around eyes. Plus, avoid playing, picking and excessive touching your lashes,” warns Richardson. Stick with oil-free products after getting lash extensions done. How much does each treatment typically cost? It really depends on where you live and which spa or salon location you visit, but a lash lift can typically cost between $50 and $100, while eyelash extensions can go from $150 to $200. How do these two treatments differ aesthetically? “A lash lift will not create texture, add color, contour and shape or add dimension to your eyes,” says Richardson. “Its main purpose is to curl your natural lashes and you must have at least a 4mm lash to get the service.” Although you still need to use eye makeup with a lash lift, it’s a nice boost for the lashes. Extensions, on the other hand, “can add length, change the shape of your eye, create volume, and can be customized,” says Richardson. “Extensions have more of a WOW factor.” Eyelash extensions not only look beautiful, but they also cut your morning routine down by a lot, and who doesn’t want more timesavers in their life?